Things start a quiet confusion while Hannah tries to figure out her life after divorce and moving back to her small, rural hometown. Then chaos when she starts renovations on her house and the community finds out they are losing governmental support for the library and seniors. I am a library lover to begin with. Set that in Ireland, I am in heaven. This was a fun read. Some of the crotchety characters and the description of the landscape were great. 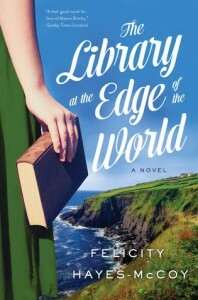 Hayes-McCoy usually writes non-fiction about the Dingle Peninsula where this book is set, so she knows the area well. Her words bring out the beauty of the area wonderfully. Hannah's character was a little too stubborn for me, at first. But as I continued with the story, I soon realized why.